I love Christmas. While Easter is a bigger chocolate festival so to speak, Christmas is where the really delightful and innovative chocolate comes out. 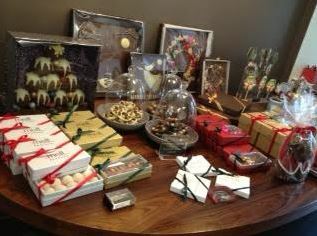 This year, Melt has pulled out all the stops and has an Aladdin’s Cave of chocolaty delights. From Christmas tree baubles with hand-piped lacy snowflakes to works of art created in chocolate, there is something for everyone and every budget at Melt. 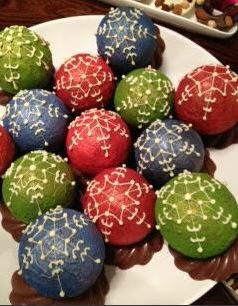 Of course, making their chocolate baubles and pieces from some of the best quality chcolate in the world naturally means they are more expensive but it is abolutely worth it. 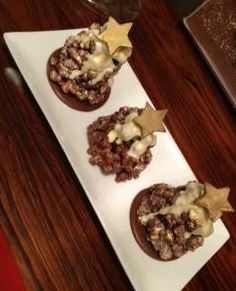 When you try your first bauble and taste that quality chocolate and then let those little balls of Valrhona chocolate melt in your mouth you’ll be hooked. I didn’t try the popcorn trees but they were just so cute and so much fun I couldn’t fail to mention them. For cute factor alone they win! 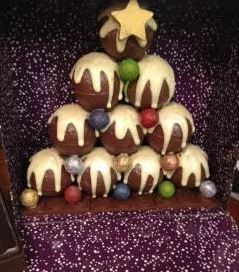 The Christmas tree made of baubles is a lot of chocolate! Seated on a chocolate slab base, the balls may be hollow but thre are a lot of them plus they are held together with chocolate and topped with white chocolate! The wreaths were quite cool. 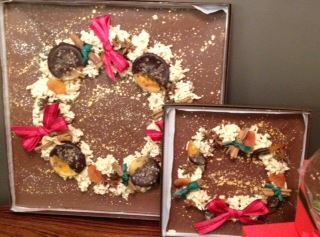 The milk chocolate slab set with white chocolate rocher to make the wreath then added to that was Melt’s famous chocolate dipped oranges along with non-edible ribbon and some cinnamon sticks with a delicate snow all around.